The former Dolphin man starts at openside with head coach Mike Tolkin keeping one eye on their pool finale against Japan. Quill in action against the Wallabies in September. He'll no doubt get to grips with another southern hemisphere superstar this weekend. SOUTH AFRICA COACH Heyneke Meyer has made just two changes to his side to face USA on Wednesday (16.45), despite the short four-day turnaround. The match will be USA’s first in 10 days, but their head coach Mike Tolkin has kept one eye on their final Pool fixture against Japan on Sunday night by ringing the changes for a midweek meeting with the ‘Boks. Corkman John Quill is one of the beneficiaries of the squad rotation as he is one of the 12 changes made from the loss to Scotland. The former Dolphin man came off the bench against Scotland, but gets his first Rugby World Cup start as an openside in a back row containing captain Samu Manoa and Danny Barrett. Ireland’s other main export to American rugby Aj MacGinty has been left out of the matchday 23. Having wrestled control of Pool B back after the shocking opening weekend defeat to Japan, South Africa are taking no chances of further embarrassment. The introduction of Frans Malherbe at tighthead and Lwazi Mvovo on the wing are the only deviations from what Meyer now considers his strongest XV and the ‘Boks will surely be intent on finishing the pool on a high 10 days before they face either Australia or Wales at the quarter-final stage. Email “Cork's John Quill starts for USA opposite a mean-looking Springbok back row”. 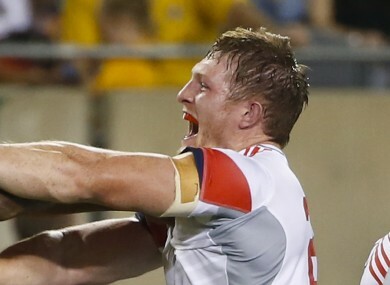 Feedback on “Cork's John Quill starts for USA opposite a mean-looking Springbok back row”.